Aurora Place is a landmark mixed use development situated in the core of Sydney’s Central Business District on the site of the former State Office Block. The project comprises the 41 level commercial tower, the 18 level residential building and supporting retail facilities around the piazza. The 49,400 m2 site is bounded by Phillip Street, Bent Street and Macquarie Street. Aurora Place was developed by Lend Lease and East Asia Property Group, the extraordinary design is the work of world renowned architect Renzo Piano. Aurora Place is home for an important collection of art reflecting both the Australian spirit embodied in this development and its international status. 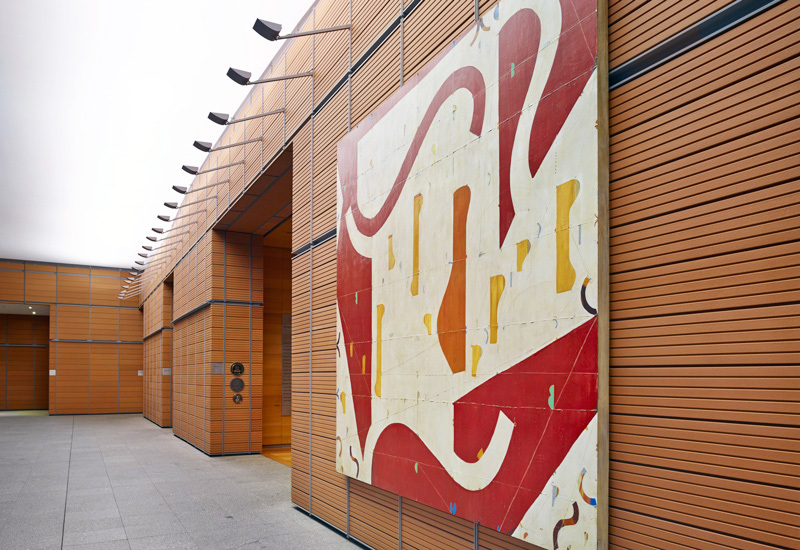 Reported to be one of Australia’s most valuable corporate art commissions, these works are viewed as considerable contributions to public art. 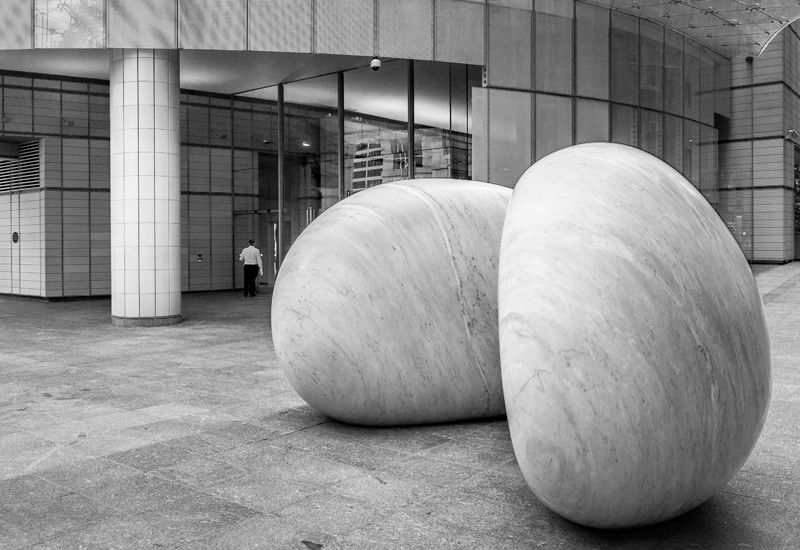 Yasuda’s work, titled “Touchstones” is a splendid example of the marriage of art and architecture. Artists are rarely brought in at the beginning of a project and rarely work directly with architects. But not so at Aurora Place. The developers encouraged the connection between architect and artist right from the commencement of the project. Fonseca is inspired by a love of music. His canvas will often appear as a lyrical play of tone, rhythm and balance all elegantly woven with the cadence of a visual counterpoint. The purely abstract works are arranged in quirky compositions which seem, at first encounter, to be random. However, with contemplation, each movement in a Fonseca painting often reveals deft precision. The placement of his signature geometric forms are not bound by gravity to the foregrounds. As a kinetic sculptor, Prentice works in a variety of lightweight materials including aluminum, stainless steel, feathers and Lexan. 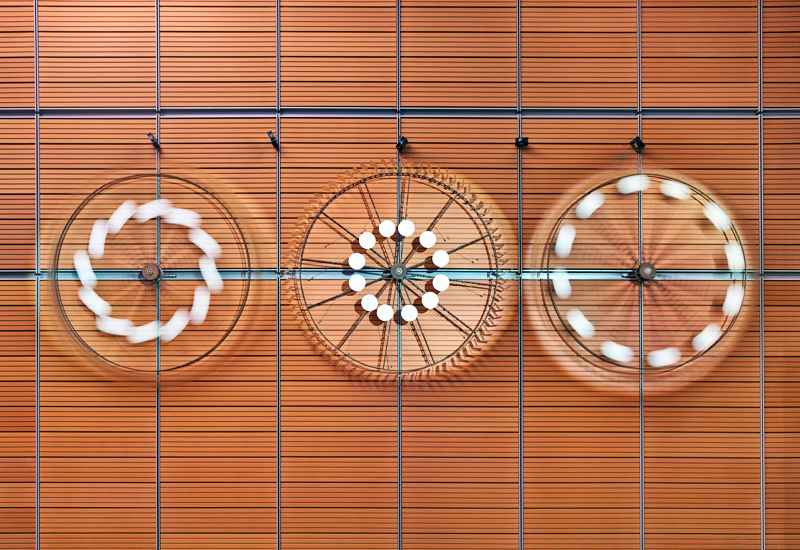 His work investigates the shape, form and flow of wind currents in order to make air visible. Prentice’s use of intriguing structures and reflective materials enable his sculptures to soar, or to undulate, in response to their environment. Architectural training has helped Prentice design commissions with a sensitivity to their surroundings whether they be for large corporations or private collections. A social space, a break-out space, a garden, and a place to get away from the office. Adding a new dimension to the way office towers are percieved, the natural environment of the wintergardens demonstrates that the skyscraper doesn’t have to be a hermetically sealed building. Located in the NW and SE corners of the tower floor plate and maximising the dramatic harbour and park views these wintergardens are occupiable balconies elaborated with a sophisticated operable louvre facade. Each occupant can adjust their louvres and blinds according to the time of day or season.